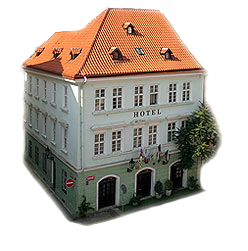 Betlem Club Hotel is located in the heart of Old Town Prague near the Jewish Quarter. In the vicinity are the Charles Bridge, Old Town Square, Hradčany, Prague Castle, the Royal Route, Bethlehem Chapel and many other landmarks of Old Prague. Jewish Town or the Jewish Quarter (Czech. Židovské město) is now called Josefov. It is the smallest district in Prague, surrounded by Old Town and is part of Prague 1, it has also been known as the Jewish ghetto, the Jews, or the Fifth District. The first Jewish merchants and moneychangers settled in Prague in the 10th century. The Jewish Quarter of Prague was founded in the 12th century as a Jewish community between the Charles Bridge and Old Town Square. The Jews there had their own government, schools, courts and represented all the other Jewish inhabitants of Bohemia. During its heyday there were as many as 1,900 inhabitants and it became the largest economic and cultural center for the Jews in Europe. Persecution against Jews has been documented since 1096, when the first Crusade passed through Prague. In 1389 another great persecution took place in Prague's Jewish ghetto, and as a young boy Avigdor Kari, who later became a rabbi, experienced it personally. Based on his experiences from childhood he wrote Selichot - penitential prayers that are still read today. Although the Jews in Prague were persecuted, locked in the ghetto, their contact with Christians and trade had been restricted, many immigrants still prospered and came here from across Europe. Thanks to beneficial loans from Czech rulers, they managed to gain their protection and many privileges. The prominence of the Jewish Quarter was confirmed by the construction of the Synagogue (Czech. Staronová synagoga) in the 13th century. Synagogues were like city halls for the Jews and were used not only for sacramental purposes, but also for teaching and dealing with all public affairs. A period of relative peace and prosperity alternated with periods of oppression and forcible expulsion of the Jews. At the turn of the 16th and 17th century, during the reign of Rudolf II, the golden age of the Jewish ghetto began. Rudolf II reaffirmed the privileges of the Jews and the Jewish Quarter began to flourish. The population has risen sharply, synagogues Maisel, Pinkas, and High, as well the city hall, and many other private and public buildings were constructed. The famous Talmudist schools operated in Prague, and created many eminent literary and scientific works with the help of the Hebrew printers that worked there. Many important figures in Jewish culture and science are connected with this period; Chronicler David Gans, Rabbi Yehudah Livi ben Bezalel, called Löw, known as the creator of the legendary Golem, Mordechai Maisel - Court Jew and financier of Rudolf II., the richest man in Prague, patron and builder of the ghetto, Astronomer Joseph Solomon Delmedigo, Baševi Jakob, who was promoted to the aristocracy as the first Jew in the Habsburg monarchy. All of them are buried in the Old Jewish Cemetery. The powerful and populous ghetto became the capital of the Jews living outside of Israel and was called the Em be Yisrael. In the 17th century the Jewish Quarter was burned after being struck with a plague even though it was soon restored. During the reign of Maria Theresa, the Jews had to face another wave of oppression. In the 4th and 18th centuries the Jews were expelled from the country. The position of the Jews in Prague partially improved in 1781, when Emperor Joseph II issued the Patent of Tolerance, which allowed the Jewish inhabitants access to the schools. In 1848 the Jewish population was emancipated and they were allowed to freely move out of the ghetto for the first time. This had the paradoxical result of a rapid decay of the Jewish Quarter. The wealthier Jews immediately moved out, and poor people moved there regardless of their religion. The ghetto became a refuge for criminals, then quickly deteriorated and became a red-light district. In the 80s of the 19th century, the city council of Prague decided to reconstruct almost the entire ghetto despite opposition from the public. A number of synagogues, private homes and palaces were demolished, but six synagogues - Old New, Klaus, Pinkas, Maisel, Spanish, and High, Prague's Old Jewish Cemetery and the baroque town hall were preserved and are now considered the rarest Jewish sites in Europe. The Jewish Museum was founded in 1906, and has preserved many historic and artistic monuments from the demolished houses and synagogues. After World War II the museum also gained many artifacts from the estates of the Jewish people who did not return from the Nazi concentration camps. Currently, the Prague Jewish Museum is working together with the museum in Jerusalem which is the world's largest Jewish museum.